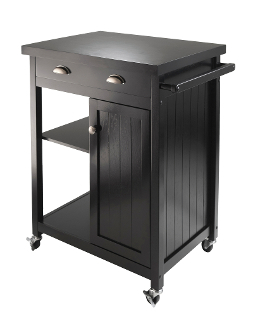 The Timber Kitchen Cart with wainscot panel and finished in black compliments your kitchen very nicely. Top surface working area is 25.6"W x 19.3"D. One large drawer with inside dimension of 20.7"W x 13.5"D x 2.75"H. One side has open storage with one adjustable shelf. The other bottom half has closed cabinet with one adjustable shelf. Inside cabinet size 10.5"W x 15.6"D x 22.2"H (without shelf). Made of combination solid and composite wood. Ready to assemble. Top surface area is 25.6"W x 19.3"D. A drawer with inside dimension 20.7"W x 13.50"D x 2.75"H.
One side has open storage with an adjustable shelf. Has a closed cabinet with adjustable shelf. Inside cabinet opening 10.5"W x15.6"D x 22.2"H. Made of solid/composite wood. Assembly required.